It’s not as if Jay Hedgecock doesn’t know his way around a race car. A fabricator with over 20 years of experience, Hedgecock has built the race car chassis used by Petty Enterprises and Richard Childress Racing. Hedgecock’s cars were driven by Richard Petty himself, along with Dale Earnhardt, and are still popular among local drivers. 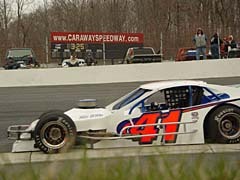 Hedgecock’s Late Model Stock Car chassis are widely used by NASCAR Dodge Weekly Series teams throughout the region. started out like that and it’s continued the whole year long. We’ve given up a good chance to run for the championship. I think if we’d have won those four or five races, the rest of the season would’ve taken care of itself. But instead, we’re not even in the hunt for the points championship. In addition to competing on the Whelen Southern Modified Tour as a driver, Hedgecock has expanded his chassis business to include the Hedgecock Racing Academy, a fabrication training and certification course. The all-new Academy offers an eight-week course and is certified by the North Carolina Department of Labor and Education. As a driver, Hedgecock has spent the 2005 season competing on the NASCAR Whelen Southern Modified Tour, but the High Point, N.C. resident has endured a trying year on the race track. 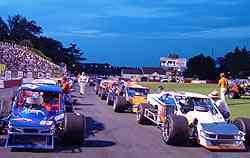 He’s won four Bud Pole awards and led over 220 laps, yet didn’t finish five races. He’s run at the front of the pack, yet suffered engine, axle, electrical and overheating problems that sidelined his team in several events. After 11 races, Hedgecock is tied for seventh in the point standings with Frank Fleming, 262 points behind leader Junior Miller. “About six or eight months ago, I decided to make some changes and do some different things with my business,” Hedgecock said. “We’re still building cars for other people, but we came up with the idea of a fabrication school. It’s geared towards NASCAR-type fabrication. There’s a little bit of classroom work but it’s mainly hands-on. Over last three weeks of their course, the students all build complete NASCAR Late Model Stock Cars. We go to the race track and I test the cars. Hedgecock says the school was established to meet the growing demand for well-trained chassis fabricators – many of whom will wind up working for the top NASCAR teams in the nation. Potential students car learn more about the Academy on Hedgecock’s own web site, www.hedgecockracing.com. The Hedgecock Racing Academy is taking off, but this week, Hedgecock will focus on improving his racing luck in the Whelen Southern Modified Tour finale, Oct. 29 at Ace Speedway in Altamahaw, N.C. The event caps off the Tour’s inaugural season and will crown the Tour’s first NASCAR champion. The #41 sits on the front row at Bowman Gray Stadium.